Here’s a pretty cool little adjustable power regulator by DROK® I received it today through Amazon. I’m always needing to hunt around my office for a proper power supply to power whatever electronics item I’m playing with at that moment. I’ve got several regulated power supplies, but none of them are adjustable. So this unit is just what I needed. A go-to device that I can fully adjust from 0-30V, and can also handle a load up to 5A. 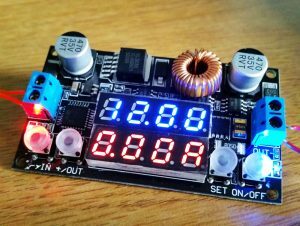 PLUS, it’s got a couple awesome displays for showing voltage and amperage of both the incoming and outgoing power. So, I jumped right in to give it a thorough run-through. Visually, you immediately notice the two segmented LED displays. The top display (blue), shows the voltage, while the bottom (red) shows amperage. You can switch between viewing the incoming power or outgoing power by simply pressing either of the two left buttons (labeled “-/IN” and “+/OUT”). The outgoing power can be adjusted by first pressing the “SET” button. This allows you to step-through and set the voltage and amperage separately. Upon first pressing “SET”, the bottom display begins to blink, indicating that it’s ready to be set. This is done by using the left two buttons (“-/IN” and “+/OUT”). Once the amperage is set, you press the “SET” button to toggle to the voltage setting. Once that’s adjusted, hit the “ON/OFF” button to “save” the settings. The output power must be manually activated by pressing the “ON/OFF” button. When it is on, a blue LED just to the right of the “ON/OFF” button will illuminate. 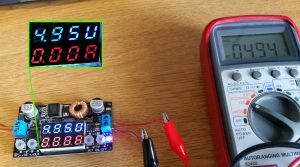 At this point, both displays will show both the voltage and amperage of the outgoing power. Breaking out the voltage meter, I first set the regulators output voltage to 5V and current to 1.80 Amps (just an arbitrary value I picked). Upon turn “ON” the output power, the voltage display on the module showed between 4.95 and 4.97 Volts, which is within 1.0% or less of my set voltage. Measuring the output voltage with my voltmeter, I get 4.94 volts, or within 1.2% of my desired 5V. This is certainly acceptable for any of the diverse projects I work on, so I’m quite pleased. Time for a load test. One project I’m building uses compressed air, which is controlled via a 12V solenoid valve. 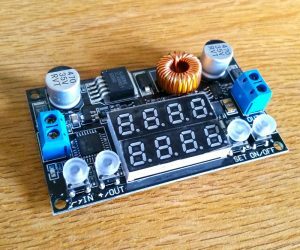 I went ahead an decided to use just 10V for the test, which is what I set the output voltage to be. I left the amperage at 1.80. 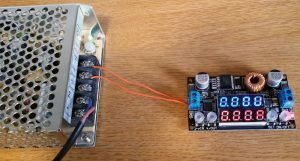 The regulator’s displays showed 1.03 Amps and 9.99 Volts once I hooked-up the solenoid and turned the output power to “ON”. 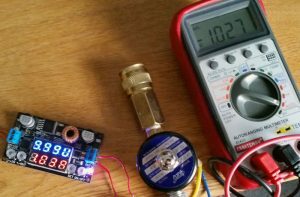 A quick check of the voltmeter confirmed a current of 1.027 amps, which proves the accuracy of the regulator module. Being able to see the actual current being used by the power supply (and NOT needing to use a voltmeter) is an awesome feature!! Aside from the ability to adjust the output power, the voltage and amp displays are immensely helpful. By default, when you power-up this module, the power output will be set to “OFF”. However, as I discovered, you can change this to automatically set the power output to “ON”. To do so, power-down the module. Then, while pressing the “ON/OFF” button, power-up the module. You’ll see a message that says something like, “-F1- ON”. Now every time you power-up the module, the output power will be active. You can return to the default “OFF” state by repeating the above steps. Overall, I think this is a fantastic module. I can see using it for all kinds of projects. I’d give this “5 stars” since it does exactly what it’s suppose to do. and more! I’m very pleased. You can find this module here on Amazon. (and no, I don’t get any kind of referral benefits).